Hey guys! I’ve spoken a little about ion technology on the blog recently with the ION-Sei Electric Toothbrush. Today I’m going to be talking about another ion tech product, but a type of product that you probably already associate with ion tech. Yup, that’s right! We’re getting loud and hairy and we're talking about an ionic hairdryer today. The Aphrodite Ultra Ionic 3000 Professional Hair Dryer is designed to use ions to smoothen the hair as it dries, leaving you with silky smooth hair and less frizz. It has two speeds, three heat settings, three nozzle attachments and 2100W of power. One nozzle is for fast drying, another for straightening and one for setting. On top of the hairdryer is a small blue diode which creates negative ions that are blown onto the hair. This negatively charges the hair, reducing static and leaving the hair feeling and looking silky smooth. To help me out with this review I have enlisted my sister. Her hair type is very different to mine and this hairdryer could get a really thorough road-test on her hair. My hair is very fine and lacking volume, but my sisters hair is Afro-Caribbean, so it’s very thick, curly, dry and prone to extreme frizz. Could this finally be the best hairdryer for her thick and curly, frizz-prone hair? Let's find out! The first thing I noticed about the Aphrodite Ionic Hair Dryer is that the switches are on the side of the handle rather than in the middle. At first I thought that the positioning of them may make it a little uncomfortable to hold, but that’s really not the case at all. It's actually comfortable and the buttons don't get flicked during use accidentally either. For my hair I tried out the fast drying nozzle and I do find that this dryer works quickly. This means that you can have your hair fully dry in a short amount of time. It packs a punch and is very powerful, which is a plus. It’s also a nice weight which means that it’s easy to use. I’ve definitely used heavier hairdryers which didn’t have the power that this one has, so again, that’s a bonus. The heat settings seemed somewhat similar temperature wise and the hottest setting isn’t incredibly hot like some hairdryers. Whether this is a pro or a con I think is down to personal preference and how hot you prefer your dryer to be, but for me the temperature is fine and therefore I have no complaints. I do recommend making sure that the attachments are on the dryer well enough before you start using them. I’ve had a couple of moments where I thought the fast dry one was on securely and I’ve been blasted in the head with it mid-dry as it shot off the hairdryer like a canon ball. I now make sure that it’s on extra tight before use and I’ve had no issues since. When the ions are on and I dry my roots, my hair does turn out with a little less oomph and volume. To counter this, I’ve been using the hairdryer with the ions off to dry my roots and I turn it on to dry the ends. The downside with this is that the only way I’ve worked out to turn the ions off so far is to lower the heat, so it means that you need to use it cold. My sister gave the comb and setting attachments a whirl when she tested out the hairdryer and she had a few points to make after use. Firstly, she wasn’t very keen on the comb attachment as she said it was difficult to use. She explained that as you try to dry the hair with it, the hair was blowing all over the place. Putting that aside though, she had no other complaints. She was mostly happy with how it heavily reduced the amount of frizz that she normally has to contend with and therefore made straightening a far easier job. She also loved the setting attachment to help set her hair at the end as it left it feeling and looking soft and shiny. She agreed with me on the point of it drying hair incredibly quickly, a sure feat for her as it normally takes a very long time to dry her hair properly due to it being so thick. She also commented about how powerful and lightweight it is, two other points we agreed on. Instead of leaving her with big, "Tina Turner hair" as she always calls it, she was left with much smoother and silkier strands that were far more manageable. So yes, overall, we’re both really happy with how the hairdryer works. 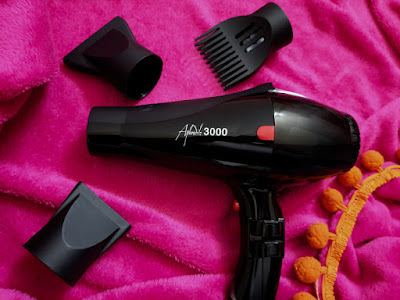 It has different downsides for each of us, so what you may love or dislike about it personally may be down to your own hair type and what you want out of it, but the general consensus is that it’s a fab little hairdryer. 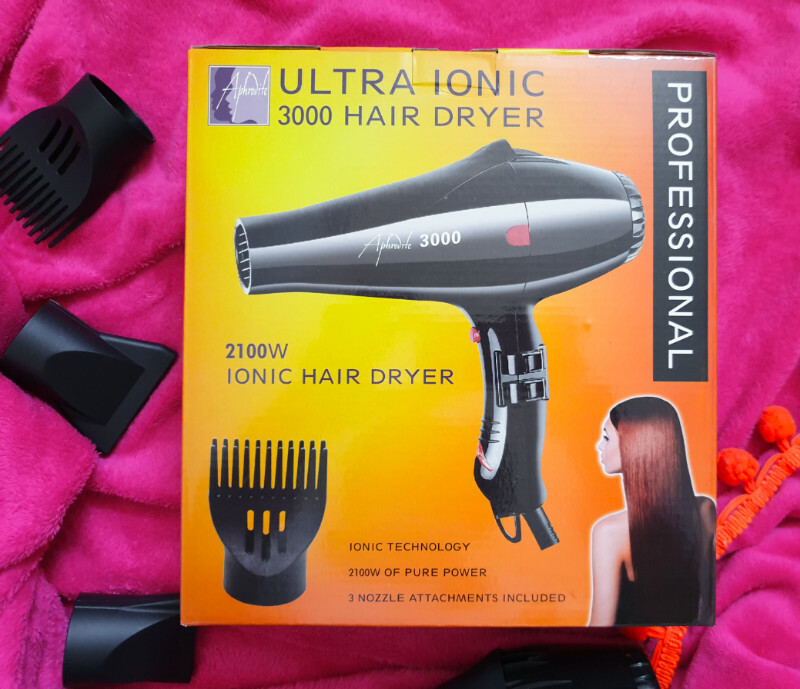 If you'd like to get your hands on the Aphrodite Ultra Ionic 3000 Professional Hair Dryer then you can find it at Beauty Hair. What are your thoughts on the Aphrodite Ultra Ionic 3000 Professional Hair Dryer? Are you a fan of ionic hairdryers?